Over the last 7 days, the Greater New York Red Cross provided emergency assistance to 157 adults and 60 children following 57 disaster responses. Here are some highlights from last week and a preview of upcoming activities (see below). The Red Cross responded to a raging 4-alarm fire Sunday night in the Far Rockaways by opening a reception center and providing emergency support for the families that had to evacuate the 7-story apartment. Volunteer Vivian Moy provided this harrowing account from a young second grader who lost her home that night. The NY Air National Guard's Bravo Company 642 Aviation Support Battalion (ASB) hosted a Round Robin' Expo on Sunday for emergency response agencies to improve future coordination efforts during disasters or emergencies. 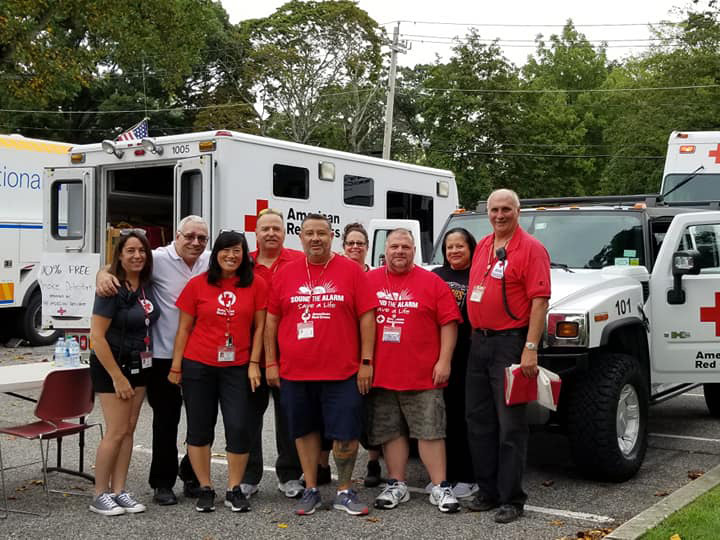 On Saturday, the Long Island Red Cross participated in a very fun “Touch A Truck” community event held by the Brentwood Library. Six Metro NY North Red Crossers were at the New Windsor Gardens Complex visiting 66 Homes where a total of 144 Smoke Alarms were installed and 133 Residents were given fire safety and hurricane prep tips. Good work team! We are so proud of our four legged volunteers who were recently featured on petMD for their amazing work supporting military members and their families. News12 Brooklyn spoke with Red Cross about back-to-school safety tips. Stay safe everyone! On Thursday, the Long Island Red Cross hosted the first annual LI Disaster Recovery Networking Expo for over a dozen social service agencies to better coordinate and collaborate on serving and helping our clients. Sept 11, 14, 17: Red Cross blood drives will take place from 2 to 7 p.m. at the Greater NY Red Cross building located at 520 West 49th Street, Manhattan and other locations. Schedule an appointment to donate today. You can also Find Reliable towing company in New York Find the best reliable towing services company near in New York. We are providing fast, courteous & inexpensive towing services in Brooklyn, Queens and Manhattan at Towingservicenearyou.com.